An extensive mountain range provides the setting for one of the most majestic of the state parks and one of the earliest CCC projects in Texas. Work at Davis Mountains State Park commenced in June 1933. The Texas legislature specifically directed the new State Parks Board in 1923 to investigate the Davis Mountains for a major destination park to attract both overland motorists and train travelers from nearby Marfa and Alpine. But the State Parks Board failed to obtain land donations or appropriations. Then in 1927 the legislature instructed the State Highway Department to build the Davis Mountains State Park Highway on donated right of way, now the Davis Mountains Scenic Loop (State Highways 118 and 166). The new byway construction created much-needed jobs for the region and in the 1930s facilitated construction of McDonald Observatory by the University of Texas on Mount Locke. But by 1933 the Great Depression had so devastated the local ranching economy that landowners at last agreed to donate the initial 560 acres for a state park in Keesey Canyon, along the highway toward Mount Locke. The National Park Service then assisted the design and the CCC built inside the park a five-mile scenic road, carved in switchbacks, ascending to the top of the ridge between Hospital and Keesey Canyons. 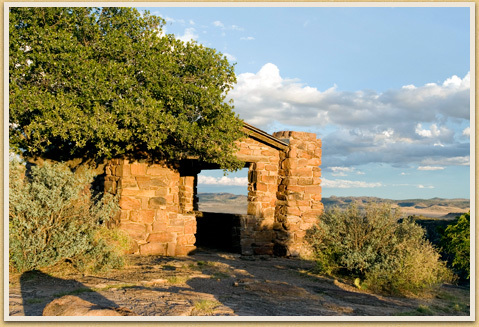 From this ridge, visitors enjoy breathtaking panoramas, including a view of the 19th-century military installation Fort Davis, which lent the adjacent valley town its name, and McDonald Observatory on a mountaintop to the north. Likely designed by William C. Caldwell, the stone overlook shelter at the top resembles the prototype that National Park Service architect Herbert Maier designed in 1924 for Yosemite National Park, right down to the "picture window" framing a fabulous view for mountain trekkers resting inside the shelter. Skyline Drive, Overlook Shelter, two Mess Halls (both adobe; one used by CCC as recreation hall for a short time, currently a residence; the other currently storage), Stone Picnic Tables, Stone Fireplaces, Stone Steps, and Latrine. See also the text for Indian Lodge.